With the cost of consumer electronics in many areas becoming more and more affordable these days, so too have the introduction of rear view video cameras (as well as dashboard cameras) in vehicles seen the market grow by leaps and bounds. Rear View Safety, which is the industry leader in the sales and distribution of backup camera systems, has recently announced its LK-7950 Lukas Dual Lens Dash Camera that comes complete with Wi-Fi and GPS support. There are many different ways to make use of dash cameras, where they would certainly come in handy whenever there is an accident, or perhaps you have the need to prove the timeline of the event from footage for insurance purposes, and even in certain cases, to dispute traffic tickets or to record a summer road trip. One of the most important features that one ought to to look out for in a dash camera would include video quality, viewing angle and design. 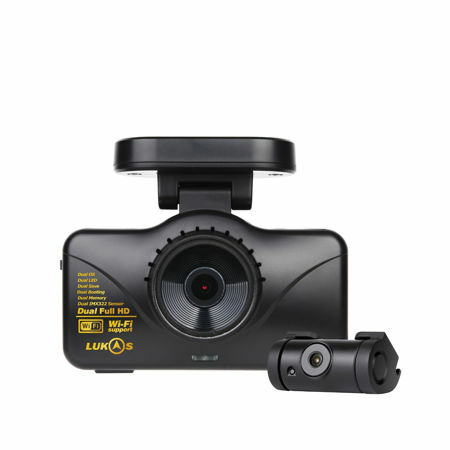 The LK-7950 Lukas Dual Lens Dash Camera with Wi-Fi and GPS will hopefully not disappoint, thanks to the slew of features that have been thrown into the mix. For starters, the LK-7950 will arrive with not one, but two cameras, where there will be one in front while another is located at the back, delivering full HD video recording either way. In other words, it is as though you have a couple of dash cameras in one, where the front camera boasts of an ultra-wide 135° viewing angle, while the rear lens has a 130° viewing angle. The camera will include not one, but two cards (one SD and one microSD card) to help you save space while ensuring that all important footage will be protected. Sporting a combined storage capacity of 512GB, you as the driver will never need to worry about running out of space ever again. With its built-in WiFi and the free Lukas app for smartphones, one can view live footage wirelessly as well as download them sans wires from both cameras, while the built-in GPS records your vehicle’s location and driving route to boot. Any takers?